Rockwell Automation Is Killing It, So Why Isn't Its Stock? 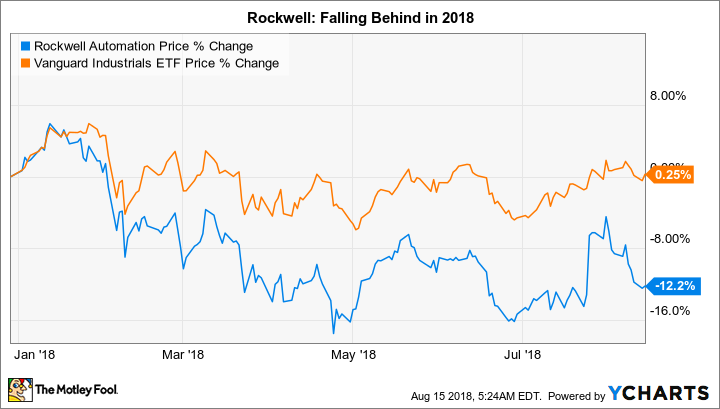 Rockwell Automation Inc.'s (NYSE:ROK) stock has lagged far behind its peers so far this year, dropping 12% while the Vanguard Industrials ETF is effectively flat. You might think that Rockwell has been putting up weak earnings numbers, but that's not the case. Here's a look at what's going on and what investors should do now. When Rockwell reported fiscal third-quarter earnings, it provided full-year adjusted earnings guidance of $7.90 to $8.10 per share. When it entered fiscal year 2018 it was projecting adjusted earnings of just $7.20 to $7.50 per share. The business has actually been performing better than management expected. The automation specialist's adjusted earnings were $6.76 per share in fiscal year 2017. Organic sales growth, meanwhile, is now projected to be 6% for fiscal year 2018, which is at the high end of the company's original 3.5% to 6.5% goal. To be fair, the company's GAAP earnings are expected to fall dramatically in fiscal year 2018, dropping to a range of $3.29 and $3.49 a share. This, however, was largely driven by one time items like adjustments related to tax law changes in the United States and costs related to a recently inked partnership. Adjusted earnings are a better picture of what's going on at Rockwell today. Based on those numbers, which are quite strong, you might expect the stock to be doing much better than it is this year. Fundamental performance at Rockwell remains strong, but the stock rose dramatically in calendar year 2017. The shares advanced a huge 46% last year, more than doubling the roughly 19% gain for the Vanguard Industrial ETF. Helping that outperformance was a buyout offer from Emerson Electric, which Rockwell turned down. 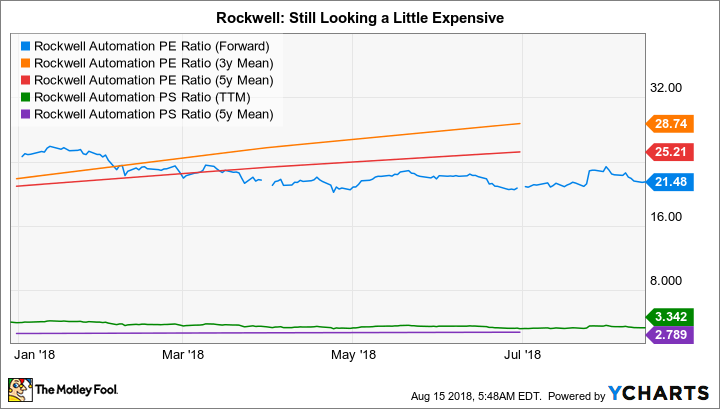 By the end of 2017, Rockwell's shares traded with a forward price-to-earnings ratio of nearly 24.5, which is above its five-year average P/E of roughly 21. And the price-to-sales ratio ended the span at almost four times compared to a five-year average of 2.6 times. Rockwell had a great run, but by the end of the year is was looking expensive. So, despite good underlying performance in 2018, it appears that Rockwell is just giving back some of the outsized stock gains it scored last year. Although the charges related to the tax law change complicate the picture, Rockwell's valuation continues to look a little stretched relative to its past. The forward P/E is down to 21.5, below the current five-year average, but that five-year average now includes abnormally low earnings due to the GAAP accounting for the tax law changes. And 21.5 is still a little higher than the 21 average at the start of the year. A clearer picture is provided by the price-to-sales ratio, which is currently 3.3 times versus a five-year average of 2.8 times. Overall it looks as if investors continue to award Rockwell a premium price. It is a great company that is executing well today, but it isn't a great bargain. Shareholders of Rockwell should be comfortable holding the stock. The stock's underperformance in calendar year 2018 doesn't appear to be related to a change in the company's fundamentals. If anything, Rockwell is doing better than expected. If you are looking for a good entry point into Rockwell, however, the stock is cheaper than it was, but still not exactly cheap. It's worth keeping on your wish list, but it's probably still best to wait for a better entry point.